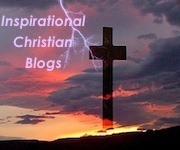 I’ve come across a few Blog awards. These awards are based on either public vote or on a fixed set of criteria. They are meant to recognize content that is creative, encouraging, or informative. Awards are another way to just say “Thank You.” They simply validate something that has been accomplished in a visual or tangible way, but most importantly they testify to someone’s commitment to excellence. The Apostle Paul said, “Pay everyone what is owed: taxes to whom taxes are due, revenue to whom revenue is due, respect to whom respect is due, honor to whom honor is due.” (Romans 13:7). I believe that true believers and followers of Jesus Christ are actually like lighthouses for God. 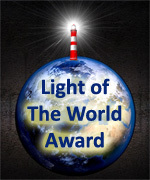 For this reason and because Jesus himself said that we are the “light of the world,” I decided to create The Light of The World Award to honor authors (bloggers) whose presence on the web serve as a shining light for Christ and His Gospel of salvation. If you have been nominated to receive this award and chose to accept it, here is what you need to do.